Although a baby crying is just one of those normal parts of having a baby, sometimes it’d be nice to know why exactly they are crying. Typically it’s pretty easy to figure out, give them a bottle or change their diaper and you’re good. However, sometimes the crying just keeps going, so at those points it would be nice to have a translator. 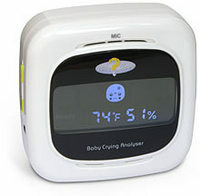 Oddly, Think Geek is there to rescue you with this Why Cry Baby Analyzer. Just whip this out and it’ll take the gadget about 20 seconds to figure out what’s wrong with your little one. It will then show a face on the screen that you can link up with the five different possible issues. There is stressed, sleepy, annoyed, bored and finally hungry. It’d be nice if it translated things a bit more specifically, but at least it’s something. It also displays the room’s temperature and humidity. To keep it powered, it requires 4 AA batteries. You can purchase it for $99.99. dont waste your money on such a stupid thing… or do if you have money to throw.